Historians: we’re great, but what the hell is wrong with you? The historians in the survey were generally satisfied with their careers, with 41.2 percent reporting they were somewhat satisfied, 46.5 percent reporting they were very satisfied and only 2.2 percent reporting they were very dissatisfied. One area of frustration — with 55.7 percent expressing dissatisfaction — was “effectiveness of academic leadership” at their institutions. Comments indicated that many were frustrated by responses to recent economic challenges. And your music? It’s just noise! Having just gotten around to reading my teaching evals from last semester, it seems like the feeling is mutual. . .
Are your students are under-prepared according to your expectations? Then, you have to adjust your expectations. Do not complain about not getting students that don’t exist. Our goal and duty is to provide every class with the best education possible. Well, by asking for the impossible you fail to meet your goal. koshembos–I agree. I think it’s actually pretty disturbing that 70% of my tenured colleagues are so disappointed with both their graduate AND undergraduate students. I’ve done that “King Lear” thing with *a* cloud before, and don’t get me started on THE Cloud, or rather the naive notion dispersed through various parts of academia that “The Cloud” is “our friend,” and moreover “here to set us free…” Ain’t gonna happen, I have to think. I think Koshembos hit the mark well. Further, I think one of the first things grad students and faculty should learn is that our students aren’t us. Most never want to be faculty or study that hard, or whatever. And they will still make fine adults. I’d also guess that there’s a fair bit of poor memory going on: when I look at my undergrad papers, I wonder how I was ever allowed to get a degree. I can’t be the only one. But, I’m surprised by how low the disappointment in academic leadership is. Over the course of my career so far, I’ve worked with some excellent leaders. And some really poor ones. The poor ones are way bigger in my memory. I would be curious to know what exactly why they are dissatisfied with graduate students? Is it performance in the classroom? On papers? On the job market? I mean what is it exactly you are dissatisfied with? Maybe the high percentage speaks more to their own dissatification with teaching. So you now have to spend lots and lots of time “preparing courses and assessment of student work” — wow! Wouldn’t that be part of your job even if you only worked with AWESOME students? If you don’t know Latin, what the heck are you doing in my first year class? Feh! I expect world-class students for my world-class class! Of course, what’s really sad? They don’t get “The Simpsons” as a cultural reference any more. I have to learn new pop culture tropes to get a laugh: now there’s the real tragedy in all of this. 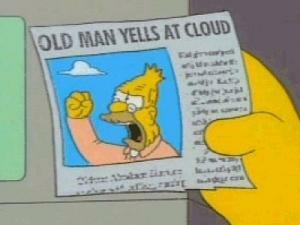 So Janice, are you saying that my Grampa Simpson joke above only reveals my Grampa-Simpsonesque not-with-it-ness? I have to say that I too am taken aback by the dissatisfaction that our compatriots report with their students, and their satisfaction with administrators. I would have thought that 70+% or more would have been complaints about administrators. I used to complain a lot about student quality and their lack of preparation in the first four years I was at Woebegone State University. Part of the problem was my own inexperience. Then I had great conversations with two of my colleagues. One of them is the grumpiest silverback ape of our merry little band of primates. He said, “Repeat after me… the freshmen are great and they are fun to teach because everything is new to them.” Which is exactly right. The glass is half full, not half empty when it comes to student preparation and ability. So prepare and plan your courses accordingly. The other colleague was an adjunct instructor who came to us with a lot of experience in secondary ed in our region. So she knew where the students were coming from and understood better than most the variable quality of high-schools in our catchment basin. One day she said something incredibly insightful: “Matt, the parents and high school teachers do the best they can to prepare the students before they hand them off to us.” You could take this as a statement of fatalism. But it also means that we are at the end of a long series of formative steps for our students. Our job is to try and meet them where they are at and help them get as far along as they can manage before releasing them into the wild. If we want better students we have to make them. That means visiting local high schools. Talking with the local social studies teachers and working with the campus recruiting office. Don’t get me wrong, I still complain about our students. I am teaching our senior seminar class for the first time and some of the papers are real disasters. I storm around the house muttering: Who is teaching them about finding and analyzing primary sources? Using evidence in essays? and Goddess help us, thesis statements? And then I remember, we are that’s who. And so if the students can’t get this stuff right after three years with us, there is no point in blaming their high school teachers. Its our curriculum. Matt–it sounds like you’ve got some humane and wise colleagues. I think you are exactly right–it’s our job to work with them when they get to campus, however they get there. If Assistant Profs had been interviewed, I wonder how different these responses would have been. The history department at my grad institution was suffering significant attrition in graduate classes around the time my grad cohort arrived, despite being a highly-regarded dept. with an extremely strong application pool (basically, they were picking among the strongest graduates of Ivyies, rigorous SLACs, and well-regarded state Us who wanted to pursue Ph.D.s in history). Their solution, at least according to rumor? They had a meeting to determine where they were going wrong in the admissions process. Friends in the department (especially female friends) pointed out (to each other; I’m not sure about the faculty) that the attrition was especially strong among female Ph.D. candidates, and suggested that the departmental culture (which both criticized female students for not speaking up enough in seminar and made it difficult for them to do so when they tried; I knew women who actively strategized to pass the conversational ball to each other, so as to increase the chances of getting a word in edgewise) played a role. Things changed a bit over time, but only very gradually (and probably as much in response to students’ efforts as to anything the faculty did). I like Matt’s “we have to make better students” approach. I’d also point out that creating all the scaffolding for assignments and providing direct instruction in various skills that professors once simply expected students to have takes time (and really requiring that they do all the steps, sending back and/or failing work if it isn’t right the first time, takes even more time, and emotional energy, especially if there’s pushback from administrators when/if students are unhappy). Both elementary and high school teachers and the people who provide instruction in lower-level college courses (i.e. adjuncts and other contingent faculty, and grad students) have increasing demands that they spend their time preparing students for standardized tests and/or conducting assessments, decreased autonomy, and stagnant (and low) salaries at best. If we could spend some of the concentrated time with relatively small groups of students that more senior faculty do, and had the same degree of autonomy and authority (and the same solid financial base), we could probably work wonders. I realize many senior faculty do do this kind of teaching, in freshman seminars, and/or by being true, hands-on leaders of large lecture classes with most of the grading/discussion handled by TAs. They have some right to complain when others in similar positions don’t do the same. Those who are expecting some poorly-paid, marginally-employed adjunct to teach the basics to hordes of entering students while being evaluated primarily through student evaluations, so that they don’t have to, do not. The area of greatest frustration was students, with 69.2 percent of the respondents expressing dissatisfaction with their undergraduates, and 67.3 percent reporting dissatisfaction with graduate students. In a recent survey of dentists, the area of greatest frustration was teeth, with 69.2 percent of the respondents expressing dissatisfaction with molars, and 67.3 percent reporting dissatisfaction with incisors. The curriculum is going backward. It seems that very many courses resemble those Sorbonne classes Historiann described in a recent post. That is why my classes seem odder and odder to the students — fewer and fewer people are using something other than canned lectures and Scantron. That is at least what it seems to be looking like this semester. @Contingent Cassandra, I agree with you here about teaching the skills the students need, and that has always been my priority. One of the problems I have with history departments (I’ve taught in several) is the generalized resistance to any kind of curricular coherence. Nobody wants to “tell someone what to do”. It’s almost a pathology. So what happens is the curriculum doesn’t make sense, nobody wants to talk about uniform standards of any kind. The difficulty then is that everyone laments the students’ lack of skills, but there is no consistency in trying to teach them. Students need to practice those skills – let’s say, writing an essay based on analysis of a primary source – not just in one class, but in many classes, and not just in one writing assignment, but at least two. I do this and my students often say, “I’ve never done this before!” I don’t know what to think. My most recent institution takes its teaching pretty seriously, but I don’t have any idea of what their assignment structure is like. I’m not saying we should police each other’s syllabi, but it would make sense to have departmental consensus about the kinds of assignments in a general sense that should be taught, especially in lower level classes. (And wouldn’t it be nice to go back to the world of prereqs, where the curriculum included actual stepping-stones for students.) And that’s the issue at my current university, where frankly teaching evals don’t matter much. At my partner’s school, merit raises are tied completely to teaching evaluations and the department has sunk into a kind of rat race to lower the bar (which is what it takes to get across the board 5 star ratings from students). As the assignments get simpler and simpler, less and less is expected of students. They are just being taught less. At my campus, we’re working on getting some consistency into assignments. So that we say, at the lower division level, people will give at least one assignment analyzing a primary source, or some such. We’ve also agreed that we require FOOTNOTES, not in text citations. Amazing how hard it is for students to do that. Perpetua, you have identified the big problem at my institution and in my department. Intellectual Freedom is interpreted as the right to do as you please when the classroom door is closed. As a result we don’t really have any coordination between classes or an actual curriculum. Well, according to the requirements for the major in the course catalog we have a curriculum, but its pretty clear that we don’t have one in practice. I appreciate the right to select my own books, create my own assignments, and organize the material as I see fit. I know my other colleagues do as well. But we really ought to create some common objectives and try to reach them in our classes. These things are not mutually incompatible. @Susan – that sounds very smart. @MattL – exactly. And what’s worse is that educrats are now imposing superficial versions of these objective in our classes in the form of core competencies or whatever they call them in their eduspeak. I hate all that garbage, but I think they’ve identified our problem and are working to fix it. When *we* don’t fix things ourselves, administrators do it, and it’s a disaster. Well, I’m going to push back at least a little on the question of department-level curricular coherence. Because–leaving aside the libertarian question of what happens or should happen when the classroom door is closed–there are typically substantially and perfectly legitimate different visions about fundamental goals and objectives within disciplines, departments, or programs. Whether these proceed from generational divisions between silverbacks and neo-rads, or between techno-utopians and techno-skeptics, or agnostics and true believers, they are deeply held and in some ways determinative at the practice level. Sending a “team” of twenty instructors down the hallways to implement a set of decisions, however loose, that have emerged from a 13-7 vote, or reaching consensus around desired skills and orientations by muting specifics and softening things around the edges, isn’t necessarily likely to produce good what-they-like-to-call “outcomes” at the end of whatever time unit you measure these things by. Most of what I learned in college was the byproduct of discovering that the faculty was an elbow-patched version of that old Supreme Court metaphor about “nine little law firms,” and I think that was to the good. Of course, as I like to tell colleagues (who don’t believe it) I majored in history without having actually been a history major–or at least for very long. By the time the registrar tracked me down and broke the news to me that I couldn’t register for courses the next term until I declared a major I had already taken almost enough courses, willy nilly. So I just “declared” the thing and mopped up over the ensuing ten weeks. In the process I managed to avoid or elide most of the essentialisms that apparently passed for curricularity back in that day. I recognize that everyone who got into college then probably had more hours of close schooling in the fundamentals than many students will by the time that we graduate them now, so don’t try this on your test track. But I’ve never run into anything in actual life (outside of the office) that looked like a curriculum, much less a syllabus, or an extension, a make-up exam, or a note from the health center, so I’ve always appreciated the residues of the chaos theory that was the liberal arts when I stumbled through them. I do like the idea of returning to prerequisites; so students don’t end up taking “Intro to [Your Discipline Here]” just so they can graduate, in the summer after junior year, probably on-line, from another institution. Indyanna’s comment about pre-requisite courses raises a related question that I’ve started thinking about, which is whether the lack of pre-reqs (often a proxy for perceived rigor), is part of the problem facing the humanities in this country, in terms of student perception–that is, I wonder whether a perceived lack of rigor leads today’s American students to think the humanities not worth their time. In both the institutions I’m familiar with in Canada, the English majors, for example, had strict pre-req requirements and a requirement for a B+ average to even get into the major program, yet they had line-ups out the door of prospective students. Whereas in the US, both were I am and from what I’ve heard of other institutions, humanities majors have few pre-reqs or other requirements, and the students rate the perceived difficulty of those majors much lower than pre-req-heavy science programs and therefore not worth their time. Or in other words, maybe if we want our students to take the education we offer seriously, we need to demonstrate, in a curricular language that our students understand, that we take it seriously as well. Lack of preparation for many students especially in writing ability is quite evident where I work. Around 50% of the country’s general population is illiterate. But, of the 50% that can read and write many of them can not perform these tasks well. My colleagues from the Caribbean lament that many of the students they teach here would never have been admitted to university in Trinidad or Jamaica. The administration lets in a huge number of students every year because it wants the tuition money and it views the university as a profit making enterprise. But, realistically a lot of the 17,000 students admitted every year probably should not have been let in if the criteria is adequate preparation for a university education of the standard that exists in the US and Canada. Getting even 400 level students to read 70 pages a week is difficult. Getting my 200 level students to do 30 pages of reading a week is extraordinarily difficult. The idea of reading whole books and writing formal essays on them still remains foreign to many students here. Poor preparation before university is a major contributor to this mind set.